7 "A New Vision for Black Freedom"
Laura Whitehorn is a New York City activist. Whitehorn served nearly 15 years in prison for militant actions against U.S. policies during the 1980s. For many years before that, she was active in a variety of radical organizations, including the Weather Underground Organization and the John Brown Anti-Klan Committee. Released from prison in 1999, she lives in New York City with her partner, Susie Day. Whitehorn is an editor at POZ magazine, a national source of information and news about HIV, and works with other activists in the New York State Taskforce for the Release of Political Prisoners. In 1976 Laura Whitehorn for Boston PFOC attended the Weather Underground and Prairie Fire Organizing Committee organized Hard Times Conference Jan 30 - Feb 1 at the University of Chicago. Freedom Road Socialist Organization's Forward Motion, Spring 1996 issue, include a poem from Laura Whitehorn Dublin California "Fourteen Days loss of privileges", and another 1988 poem from Marilyn Buck, from the same place.. 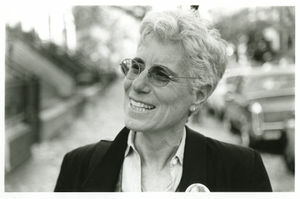 In 2008 Laura Whitehorn, NY Taskforce on Political Prisoners, New York signed an online petition “A Open Letter to Barack Obama on Iran”. Laura Whitehorn signed the statement. "A New Vision for Black Freedom"
Kevin Powell - activist, writer, public speaker, and entrepreneur and, in 2008 and 2010, was a Democratic candidate for Congress in Brooklyn, New York. Brecht Forum held a book launching March 19, 2012 for David Gilbert's - "Love and Struggle: My Life in SDS, the Weather Underground, and Beyond" with Lumumba Bandele, Dan Berger, Terry Bisson, Kenyon Farrow, Matt Meyer, Dequi Sadiki, Meg Starr, Challenging Male Supremacy Group & Laura Whitehorn. Moderated by Kazembe Balagun. This page was last modified on 19 August 2018, at 18:04.